Release Date: May 11th, 2007 (Landmark Sunshine Cinemas) by Regent Releasing/Here! Films. BASIC PREMISE: A documentary about how four Broadway musical productions ended up as Tony nominees in 2004. 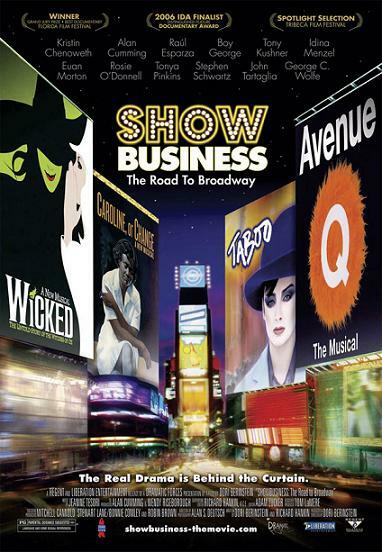 ENTERTAINMENT VALUE: ShowBusiness provides a very fascinating, suspenseful and revealing behind-the-scene look at four Broadway musicals on the long road to the 2004 Tony Awards show: Wicked, Avenue Q, Caroline, or Change and Taboo. It’s an added bonus if you’ve actually seen any of these productions on Broadway so that you would know what the theater critics are arguing back and forth about which musical they like better and why. Each production tried hard to be a memorable, lively experience, from Avenue Q and its potty-mouthed puppets to the offensive, gutsy Taboo with the wildly offbeat Boy George, which was forced to close after failing to generate enough ticket sales—although, one Taboo fan hilariously admits to seeing it over 20 times. The production went chaotic after a quarrel between producer Rosie O’Donnell and Boy George. Idina Menzel and Kristin Chenoweth, the actresses from Wicked both seem to be having a lot of fun during rehearsals. It’s really exciting, though, to watch the Bobby Lopez and Jeff Marx, the guys who wrote lyrics and composed the music for Avenue Q without any experience in theater or any financial success/fame prior to their surprise hit. Director Dori Berinstein does a terrific job of combining footage from the musicals, interviews with the cast/crew, as well as reaction of critics, which makes for a well-rounded experience. Even for those who know the results of the 2004 Tony Awards, there’s still fun to be had watching what it actually takes for the four musicals to get there. SPIRITUAL VALUE: Success in the theater industry depends on many complicated factors, but it’s certainly very nerve-racking for anyone involved with the production. Some productions close the same day they open or never open while others close later on. The lucky ones last for a while, but even those eventually close. To every beginning, there’s an end—especially in theater, it’s an unpredictable end. IN A NUTSHELL: Fascinating, revealing and exciting. A must-see for theater buffs.